Mid-summer is the best time to live on Whidbey Island — but often also the busiest. My spouse and I have now completed the first two of four visits by out-of-state friends fleeing hot weather and seeking cool experiences on our Rock. I do love catching up and sharing time with these dear friends and being their tour guide, even if it sometimes cuts short my afternoon nap and patio reading time. Of course, our half dozen friends make up less than a tiny fraction of the huge number of visitors expected on Whidbey this summer. By one estimate, we may see as many as a million folks from April through October — including the growing number of day-trippers from nearby “America” looking for a brief escape from rush-rush life and gridlock. But the two-percent hotel/motel tax we charge our guests will generate about $250,000 for Island County this year, and my calculator tells me that will be drawn from about $12.5 million paid by overnight visitors. Not too shabby. 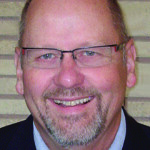 And the county is budgeting a nifty 13 percent increase in the sales tax it expects to receive this year to $16.7 million. That, my calculator says, will be drawn from taxable sales of almost $188 million. Since a goodly share of those sales is made to visitors, that’s also not too shabby. What’s remarkable about those numbers is that they are generated by generally very small, private businesses in the state’s second smallest county (San Juan is the smallest). They show that we have a diverse and growing economy. And they also show that there’s a lot for visitors to do and buy while they’re here. Through the years, we have taken our visitors on the jet boat tour under Deception Pass Bridge, on whale-watching tours in Admiralty Inlet, to the Kite Festival and the Shakespeare Festival, to the Whidbey Island Fair, the MusselFest, Penn Cove Water Festival, Oak Harbor Music Festival, Coupeville Arts and Craft Festival, and gone-but-not-forgotten Choochokam. We’ve also gone on memorable hikes and beach walks. And we have eaten unforgettable meals. Ah, yes. The foodie experience! That’s what we concentrated on with our friends Lynn and Knick from Dallas last month. Incredible food. We began on a beautiful July evening at Orchard Kitchen, the wonderful “field-to-fork” dining experience run by Vincent and Tyla Nattress in Bayview. We got tickets for one of their infrequent “farm field” dinners, where we joined 40 or 50 other folks from on and off the Rock at one long table surrounded on all sides by fields of growing corn, tomatoes, lettuce, and squash. Before dinner, we enjoyed a guided tour of the three-acre organic farm that produced many of the vegetables we later ate. 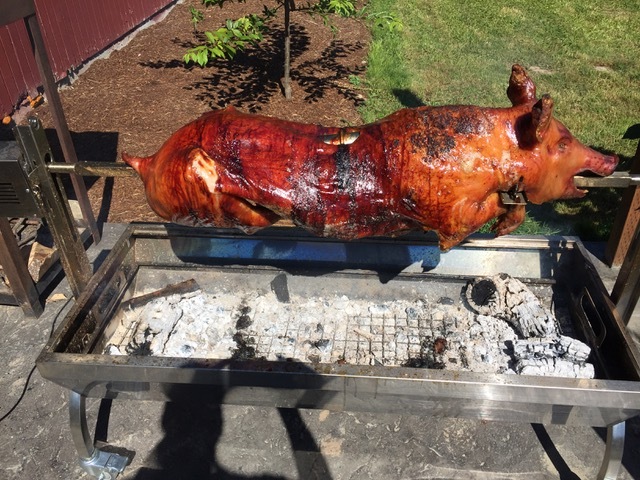 We watched as a whole hog roasted on an open grill, soon to be carved for our dinner. 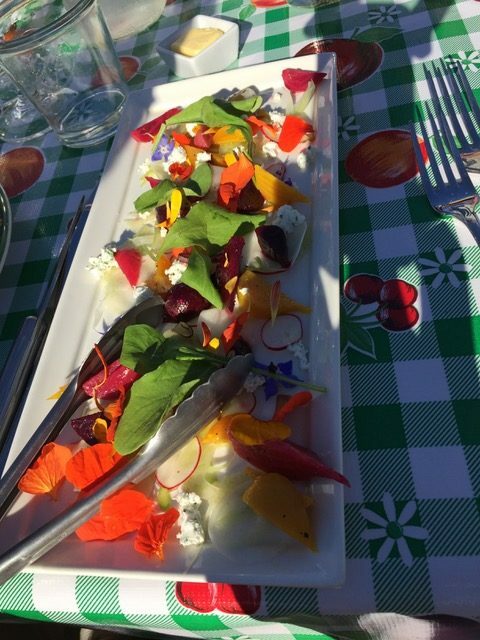 Then we sat down to four courses, beginning with a salad topped with edible flowers and capped by a dessert of freshly harvested Northwest berries of almost every variety. Marshall and Jan are classic Rock “second acters” —folks who landed on Whidbey at midlife to begin a new chapter. 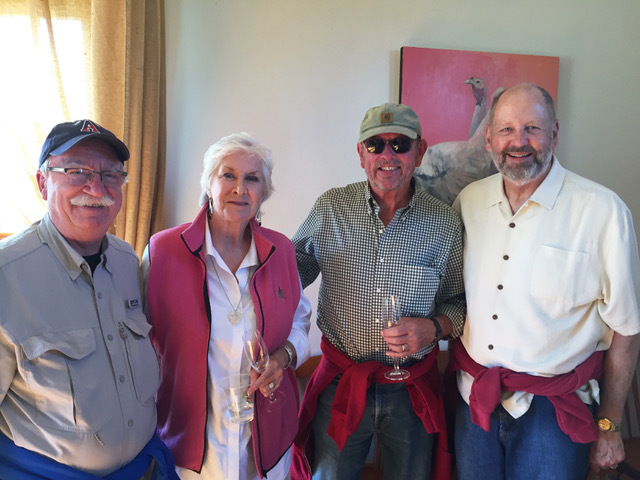 Marshall is a retired Navy captain and foreign service attaché, and he and Jan have lived all over the world. 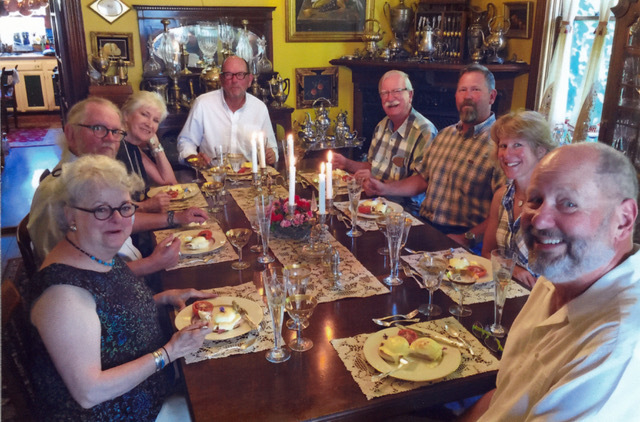 They moved to Coupeville more than two decades ago, bringing with them Jan’s collection of Victoriana. The Compass Rose is chock-a-block full of antique stuff with fascinating stories behind all of it. Hold something up, and Jan and Marshall will tell you what it is and where it’s from. Before brunch, we needed some time—and a couple glasses of champagne—just to absorb the Compass Rose surroundings. 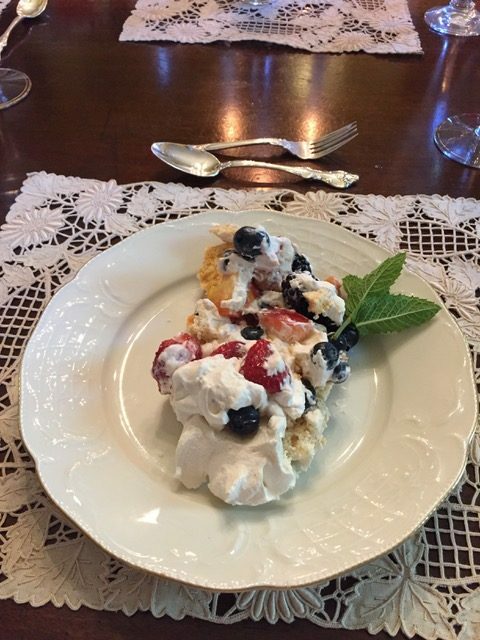 Then came the salad (locally grown, of course), the eggs Benedict (from chickens nearby and on home-baked muffins) and finally, the pièce de résistance: Jan’s stunning Pavlova meringue dessert topped with local berries. We all needed a nap after that meal. Orchard Kitchen and Compass Rose were our show-stopping foodie experiences last month. But, never ones to turn down a meal, we also savored the famous Mel’s Scramble breakfast at Knead and Feed, the Island’s best fish and chips with a glass of Parrot Red ale at Toby’s, and a couple of barbecues with Three Sisters beef at our home. All of us gained a little weight in those five days, but it was worth every new ounce we now squeeze into our jeans. Now it’s back to fat-free yogurt and veggies from my garden until the next set of friends arrives. Summer may be busy on the Rock, but it really is the best time to eat, drink, and be merry! Once upon a time, Harry Anderson made an honest living as a reporter, editor, and columnist at the Los Angeles Times. He now lives in central Whidbey where he spends his time gardening and ruminating on things that interest him. Hi, Harry (& Terry), That looks like a fabulous meal(s)! I think I’m jealous as we only got mussels from Christopher’s. We’ll have to try the Compass Rose next time. Just to be clear though…the mussels at Christopher’s were to die for!! !